A typical bathroom scale measures your body Weight and that may be just fine but you're not getting the complete picture. 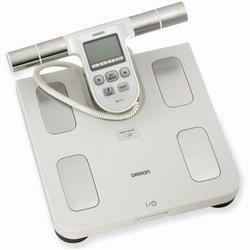 The Omron HBF-510 Full Body Composition Monitor and Scale adds additional indicators to help you take up to a six-level approach in determining physical fitness goals. So don't merely weigh your body, analyze it. Measures weight in 0.2 lb. increments, up to 330 lbs.